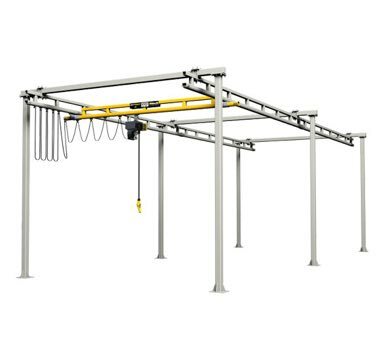 MET-TRACK® floor mounted cranes can be installed in a completely free standing format providing a flexible and easy to install solution to your materials handling requirements. MET-TRACK® floor mounted workstation cranes can be bolted directly to a standard 150mm concrete factory floor. Expensive footings are not required! MET-TRACK® workstation cranes can be installed over and around existing machinery. They can also be easily relocated when you change the configuration of your factory or move to a whole new premises. Available in 250kg to 2000kg capacity and spans of up to 10m, MET-TRACK® workstation cranes provide class leading capacity and coverage. MET-TRACK® Workstation Cranes are supplied with a hoist trolley as standard. MONOCRANE supply an extensive range of Chain Hoists to suit your Workstation Crane System. Available in 240V and 400V, JDN Monocrane chain hoists feature extremely low headroom, fast hoisting speeds and overload protection as standard. Various quantities and capacities of cranes can be accomodated on the same runway, providing flexibility and high availability of cranes to service busy work areas. The pre-engineered, modular design of MET-TRACK® workstation cranes also means your system can be easily extended or relocated as your business grows.